Well...I started back to work today! My vacation is over. I did get a lot done to my cottage this past week. Stevie borrowed a paint sprayer from a friend of his and boy did I have fun with it! I primed the rest of my fence and the arbor! Yeah! It looks so much better. I was surprised when someone had sprayed my bed for me. This is the one that I bought at the junk store a few weeks ago. It is going to be beautiful. This is where I ended up after I got finished! It was so hot and I just had to cool down! Talking about a brain freeze! That night I had the worst headache! Oh well...nothing that an old B.C. powder couldn't fix! WHat is a BC? Your lawn set looks great as well as your fence. I bet you can't wait for the finish coats. We have a paint sprayer to but i'm not sure how to use it yet. I've got to try as I have so much to paint. It all looks beautiful !! Doesn't it always amaze you when you see what a little paint can do !! LoVe your fence, and that bed is going to be sooo pretty all fixed up !! 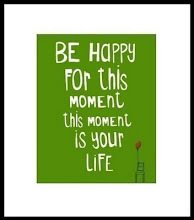 Hoping your week back to work is a blessed one !! You got lots done girlie !! FUN !! What a little paint can do! Your fence is gorgeous, the table & chairs set will be pretty with any color scheme ... AND ... that bed is breathtaking, Lee Laurie. You have to go back to work to relax, you really worked your little body on this vacation. Chuckle. Everything looks like new! So fresh and crisp. You should have sprayed the weeds green after you sprayed them white,LOL!!! Oh my! 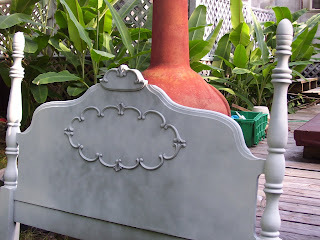 That headboard is simply gorgeous! I cannot wait to see what the final result looks like! Keep us posted! Oh yeah...i would have a good ol' time with that paint sprayer! Everything looks so good, especially those weeds in the beackground. They needed a little cottage white to spruce them up (lol)! 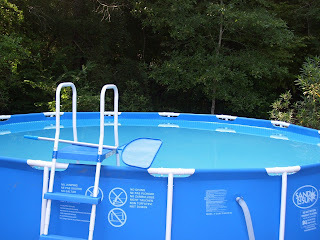 We have almost the exact same pool and we love it! I was embarrased at first, but now we couldn't live without it. Funny. I have those same sandals in white too. Glad you had an accomplished vacation. We are on vacation next week. I have so many things planned to do around the house. We are staying home on a staycation this year. I always enjoy these times of home and a few day trips. But I know it will go fast. Thanks for your annivesary wishes. I love white! I think your lawn set is great especially in white. Do you plan on adding lawn cushion to them? I simply cannot wait until your bed is done. I'm anticipating it. I was in awe when you first purchased it. I bought a headboard last month and am very excited about it. I'm not sure whether to paint it or not - it's pink!!! I'll blog it probably next month. You've got to share your projects. I love inspiration!! 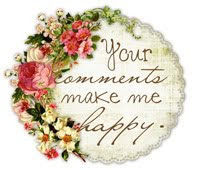 I look forward to seeing them as well as reading your lovely blogs. Thank you. Yes, put a paint sprayer in your hands and everybody better get out of the way!! It was funny about the bed....there it was in the backyard all primed, and you were wanting me to get it out to the shed so you could prime it and I was acting like I didn't want to. 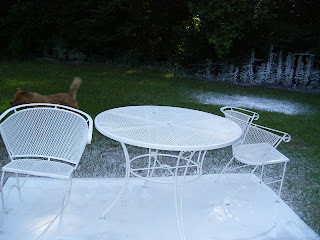 You had a big smile on your face when you saw it in the backyard already primed. The pool was cool and refreshing. Doesn't it feel good to get some things done around the house. WOW! Look at that beautiful fence! 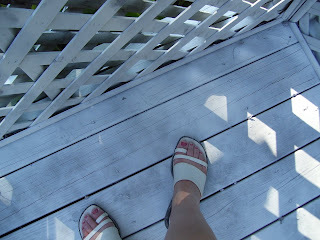 I had to laugh when I saw your feet, because I took pics of mine too after I sprayed. Several times I have forgotten to change my shoes and ruin a cute pair, ugh! But the last time I did it, I had gotten my spray tan...so when I tried to wash the paint off, my tan went with it! LOL! Bummer, actually! Love that bed and patio furniture. I can't wait to see them finished. Garrett was SO cute. He has a perfect smile!! love all your photos! love the wrought iron set too! I always wind up spraying my shoes!! LOL! Everything looks great! 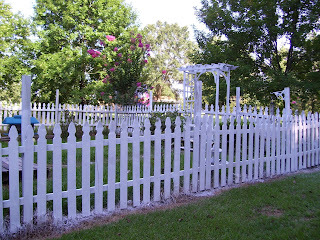 I love the picket fence and arbor! I need to paint mine too but I'll wait for it to cool down! It's way too hot right now to do much out of doors! What role do children play in our lives?